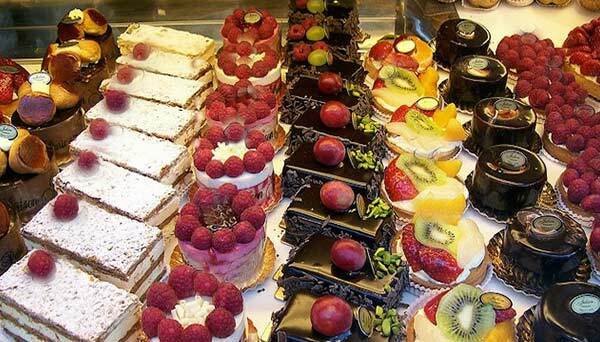 The Bakery at The French Gourmet is traditionally French and is located in Pacific Beach, San Diego. 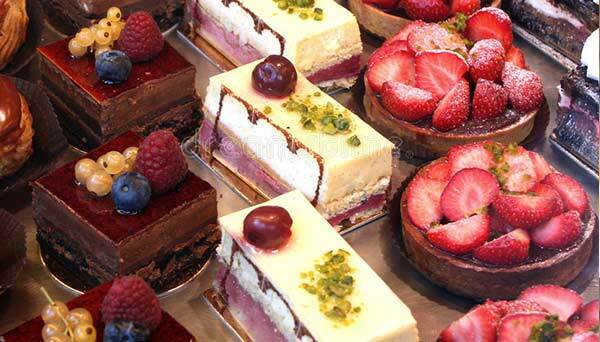 It is renowned for it’s outstanding pastries, viennoiseries, breads, and gourmet foods. The French Gourmet’s bakery is considered my many to be San Diego’s gold standard in local bakeries. Baked from scratch, our wide selection of breads, breakfast pastries, cookies, and cakes are renowned and enjoyed throughout San Diego. Signature cakes include our French Gourmet Chocolate Mousse Cake with light and airy chocolate. We also offer delicious macaron cakes – flourless, light, and berry-licious! Our espresso drinks, pâtés, quiches, imported cheeses, wines, and gourmet fare are available for you to take home and enjoy. View our San Diego bakery and pastry menu. San Diego’s gourmet bakery menu includes raspberry chocolate mousse cake along with classic French gourmet bakery goods like tiramisu, éclairs and classic napoleons. Try our strawberry bagatelle – layers of white sponge cake dabbed with kirsch syrup, filled with Bavarian cream and fresh strawberries, and topped with whipped cream and white chocolate shavings.